Wrangell/St. Elias is the largest National Park in the United States. It is greater in size than the entire country of Costa Rica. Of its 13.2 million acres, 5 million are permanently covered with snow and ice. This region has the largest concentration of mountain peaks over 14,500 feet in North America and very few visitors. It is definitely one of my favorite places to climb in the world. Come climb in this fabulous pristine wilderness before it gets "discovered." Access is surprisingly easy from Anchorage. After a 4 hour drive from Anchorage we'll either fly straight onto the mountain or spend the second night at our bush pilot's remote lodge on the Chitina River. Either way, the next morning bright and early finds us on the glacier at the base of our climb. Most of our objectives are in the Wrangell mountain range. This is inland from the coast and has less precipitation than you might imagine. The temperature range is similar to Mt. McKinley in June, varying from sunny, shirtsleeve days to storms with high winds of 40 mph or more and as cold as -20°F. Our primary goal will be to make an ascent of one of the major peaks in the range (10,000+ to 16,500 feet). Working together as a small, mobile team, we will develop our own "Alaskan style" approach to climbing from a base at our landing site on the glacier. As we fine tune skills in preparation for our climb, we won't overlook opportunities to make other ascents of unclimbed peaks near camp. Our "Big Peak" will involve one or more additional camps above base camp. It will be a route that requires route-finding skill, exciting climbing and the chance to climb where few have been before. The peaks of Wrangell/St. Elias Nation Park provide a perfect step up from glacier climbing in the lower 48 states, and are excellent preparation for Mt. McKinley or other big expeditions. They remain the ultimate destination for those who want to escape crowded popular routes and experience mountains on their own terms. Mt. Bona is an extinct/dormant shield volcano, the highest 16,000-foot peak in Wrangell/St. Elias National Park. The Duke of Abruzzi named the mountain for his racing yacht after first sighting the peak from afar. The first ascent of Mt. Bona was accomplished in 1930 by A. Carpe, A. Taylor & T. Moore, via the Russell Glacier. The group meets in Anchorage on the afternoon of day one for equipment checks and to go over group gear. Our bush pilot will arrange for a pickup early the following morning and transport us by van on a scenic four-hour drive to a remote airstrip near Chitina. From here we will either fly in to our pilot's lodge on the Chitina River for the evening or directly on to the mountain as conditions and time dictate. On the flight in to the mountain, we will experience one of the most spectacular scenic flights imaginable into base camp at approximately 9,000 feet on the Klutlan Glacier. The glacier-landing site is broad and flat and a perfect location to get started on our journey. The team will establish two additional camps prior to the summit attempt. The group will make one advance load carry to each camp in order to keep loads light and help with acclimatization. The team will practice rope travel, crevasse rescue and other expedition skills as necessary during the approach. Camp 1 will be established around 12,000 feet and a high camp is usually situated near 14,000 feet. The summit day will be with lighter packs and will involve some spectacular views. The final summit dome is normally excellent cramponing up to the summit ridge. If time allows, an optional ascent of close neighbor Mt. Churchill (15,638') may be possible the day after the ascent of Bona. There are few areas in the world that can compare with the pristine beauty of Mt. Bona and Wrangell/St. Elias National Park, and our ascent will be a climb to remember for a lifetime. I wanted to send you a quick note to express my thanks for the Alaskan Ascents (Mt. Bona) climb. We all had a great time. 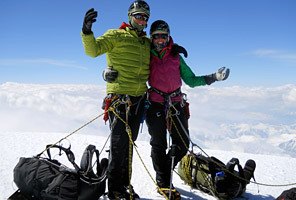 In particular, I wanted to let you know that Sheldon and Austin did a terrific job in coaching us to reach the summit. To me, so far, it's the quality of the guides that represent the distinguishing mark of IMG within the industry. It is quite clear that emphasis is placed in selecting professionals who not only know their stuff inside-out on the slopes but who also can relate well to the climbers on a personal level, identify challenges and support the climber(s) in overcoming them. Sheldon and Austin exemplified this throughout the week. Again, an incredible experience, and I look forward to my next climbs with IMG.